Plans to lay a £709m subsea electricity cable from Shetland to the Scottish mainland have been provisionally approved by Ofgem. The energy regulator said it was minded to give the go-ahead for SSE Networks' (SSEN) 600MW transmission link. 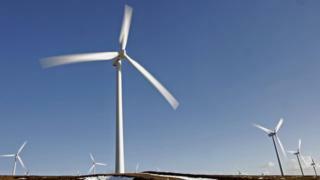 It would allow new wind farms on Shetland to export electricity to the rest of the UK. However, Ofgem has rejected current proposals for a 600MW cable linking the Western Isles to the mainland. The energy regulator said it had concerns about the cost to consumers of having the cable constructed based on the link serving just two wind farm projects on the isles. Ofgem said it would instead support alternative proposals for a 450MW cable, or even a 600MW link but at a reduced cost. The regulator said the alternative projects would need to "more appropriately" protect consumers from additional costs of funding "a potentially significantly underutilised link". SSEN said it had managed to reduce the estimated costs of its proposed 600MW link from £662.9m to £623.8m, and the 450MW cable from £616.8m to about £596m. It had proposed having the Western Isles link laid by 2023. SSEN said the Shetland link could be completed in 2024. Ofgem said it was consulting on approving the Shetland cable subject to SSEN demonstrating, by the end of this year, that the Viking Energy Wind Farm project planned for the islands had been awarded subsidies through the UK Government's Contracts for Difference (CfD) auction. The subsidies would protect consumers from the risk of paying for a link that was bigger than needed, said the regulator. Cathryn Scott, a director at Ofgem, said the regulator would be minded to approve a 450MW transmission link for the Western Isles. She said: "In terms of a larger link we would need more evidence that the size of the link was in the consumers' interest. "All consumers pay for the costs of the energy network, including transmission links. So, we have to ensure that they get value for money. "We would support a larger Western Isles transmission link if SSEN can demonstrate enough wind farm projects are likely to be built on the islands. "But as things stand there is not sufficient certainty projects will come forward." Colin Nicol, SSEN managing director, said the company hoped to convince Ofgem of the need for 600MW Western Isles cable. He said: "Whilst we welcome Ofgem's recognition of the need for network reinforcement, we strongly encourage them to reconsider and approve a 600MW link. "A 450MW link would be short sighted, limiting the potential for community schemes to benefit from renewables expansion. "Moving to a 450MW at this late stage also introduces risks and uncertainty which, in turn, could impact on the delivery of a transmission link to the Western Isles." Industry body Scottish Renewables welcomed the decision on the Shetland cable, but has concerns about the Western Isles link. Hannah Smith, senior policy manager, said: "Scotland's remote islands have some of the best renewable energy resource in the world. "We welcome Ofgem's minded-to position on the Shetland interconnector - the lack of which has left promising projects effectively locked out of the energy market for want of a network connection. "The decision to approve a smaller connection to the Western Isles - which is in an almost-identical situation - does, however, raise questions about whether consumers now and in the future will be denied access to the islands' potential for low-cost renewable generation." Western Isles local authority Comhairle nan Eilean Siar, which has been calling for a cable since 2005, said Ofgem indicating its support for a 450MW cable was a "step in the right direction". But leader Roddie Mackay added: "I am, however, extremely disappointed at the short-sightedness of Ofgem's position of being minded to approve a 450MW connection rather than 600MW. "I am confident that the present pipeline of renewables projects will quickly fill a 600MW cable and that Ofgem's fears around 150MW of stranded assets are ill-founded. "It will be in the consumers interest for a 600MW connection to be built rather than risk the high costs of a second inter-connector in a short number of years." Western Isles SNP MP Angus MacNeil said he was "dismayed" by the rejection of the 600MW proposal. He said he would be discussing the matter with Ofgem officials.